Dragon Quest is precious to me. Much like Final Fantasy, I consider the series formative in giving me a deep, abiding, and likely life-long love of Japanese RPGs. The imagination, humour, and storytelling that Dragon Quest pioneered has stuck with me over much of my life, to the point where, when there was a special 30th anniversary gallery exhibition in Tokyo celebrating the history of Dragon Quest, the very first thing I did when planning one of my annual trips to Japan was make sure that I would have the time to go to it. As I was doing my research in writing my review of Dragon Quest XI, I came across some stuff that I wasn’t aware of regarding the composer of the Dragon Quest series, Koichi Sugiyama. Sugiyama’s scores have been every bit as iconic to the series as Akira Toriyama’s art designs. The opening theme so powerful and memorable that, just like Final Fantasy’s opening theme, a fan will recognise it within the span of just a few notes. As part of the 30th anniversary celebrations, one of the Japanese railway networks played that theme every time the train doors closed at a station. It's no exaggeration whatsoever to say that Dragon Quest without Sugiyama simply wouldn’t be Dragon Quest. And this is on top of a previous incident a few years back in which Sugiyama established himself as a powerful voice in the denial of Japan’s use of “comfort women” through World War 2; in which women through Asian nations that Japan conquered were forced to work in army brothels. It was a war crime and is an ongoing source of tension in relations between Japan, which has never made reparations for what it did to a degree that has made the victim nations happy. Voices like Sugiyama denying it have most certainly not helped. I never knew about any of this, even right up until I had played Dragon Quest XI. And now that I do know it, it makes it hard to see Sugiyama’s often frivolous and twee approach to music in that series in the same light. It’s just that much harder to see something as light-hearted and entertaining once you know that its creator is a raging imperialist. That’s not to suggest that I don’t appreciate the brilliance of the music, or indeed Sugiyama’s talents as a composer. It’s not the first time I’ve loved the work of an artist despite violently disagreeing with that person and how they’ve used their fame. I spent years studying H.P Lovecraft and Roman Polanski at university for classes in literature and film, respectively, and love their work, despite the fact that Lovecraft was the worst kind of racist and Polanski did things to a young girl that should have had him thrown in jail for life. Like most people I grew up with Disney and my house is filled with Donald Duck, and yet Walt Disney was a... problematic fellow, to put it in the most generous way, and his company has certainly not been above criticism over the years for the way it has handled a wide range of subjects. Leni Riefenstahl deserves so much respect for what she brought to the structure and thinking of film, and yet she was a propagandist for the Nazi party. And one of Japan’s greatest and most important authors, someone whose books I would recommend to anyone in a heartbeat – Yukio Mishima – actually formed a right-wing militia and attempted a nationalist coup. So I’m not for a second suggesting that I need to agree with an artist’s politics and lifestyle – within or without their work – in order to appreciate what they did for the overall body of art in the world. In fact, I firmly believe that art needs to be a conversation for it to be successful as art, and without the works of the likes of Mishima, Disney, Riefenstahl, Lovecraft, Polanski and Sugiyama, we’re simply not not having that conversation. But where I was immediately aware of the artists behind the work in all the other examples, almost from the moment I started to read about them, it took me thirty years to learn about Sugiyama. It’s a reminder that, for an art industry, the games industry does a really poor job of making the audience aware of who created their games. And in any art, the creator is important. Yes, there's the debate as to just how important, and there's the whole Death or the Author thing, but it is nonetheless a basic truth that the creator an an artwork is an important part of the study of that artwork. It’s important for the analysis and discussion of the artwork that we have the full context in which it was created, and it’s important for the development of the industry that unique styles and approaches to the creation of art are highlighted and made clear, so that they might inspire or challenge future creators. Too often in video games we treat development as a homogenised environment in which there is no creator, and while that suits product development such as the latest iPhone or Samsung television set, it’s not a structure that supports genuine art. Finding out that Sugiyama is a jerk of the highest order doesn’t change my love for Dragon Quest, or my respect for its music. What it does do is put that love in context, and make me think about the tone of the music that much more. 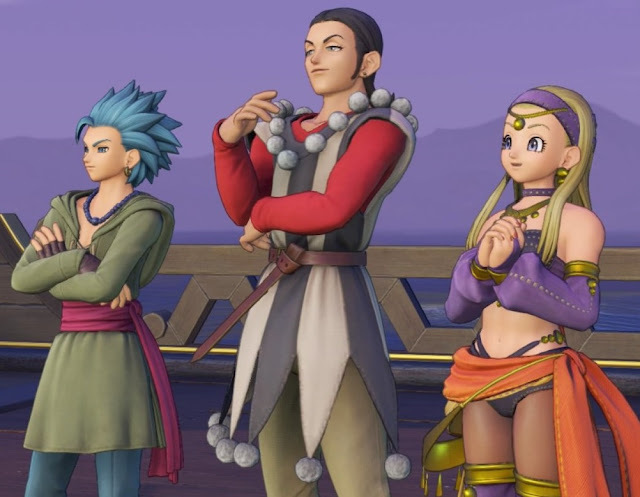 If anything, it elevates Dragon Quest’s music to the point where I have the information I need to really start to think about it. I’d encourage my fellow journalists to try and dig more deeply into the creators of games when we get the rare chance to interview them. Too often we get wrapped up in what features a game will have; how this feature or that will enhance how much fun a game will be. Or we allow developers to present themselves as a group of people in which there’s no central creator, so therefore there’s no way to get that human context behind the creation. I’d say that we need to really start to push back against this; we need to know who was responsible for key artistic decisions within a game, and then we need to understand who that artist is. Then - and only then - can we start having mature conversations about the artistic value, heritage, and impact of those works of art.